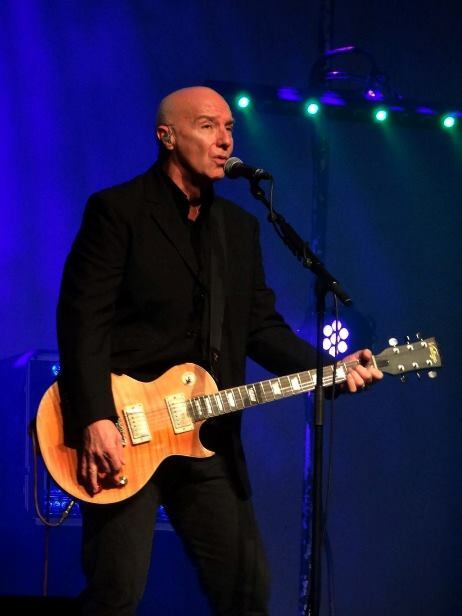 The Roman town of Verulamium, now the city of St Albans, was the location for the final night of a very successful 30 date UK tour featuring MIDGE URE, THE CHRISTIANS and ALTERED IMAGES. 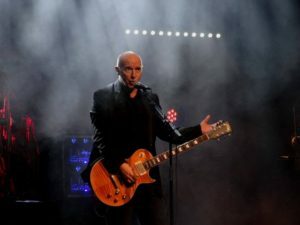 Between them, THE CHRISTIANS and ALTERED IMAGES had 7 Top 20 hit singles, while MIDGE URE’s various career exploits with VISAGE, ULTRAVOX and BAND AID have been well documented. 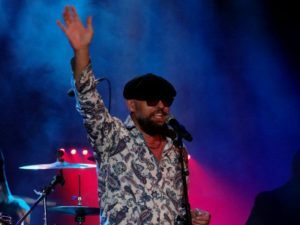 ALTERED IMAGES singer Clare Grogan additionally has her place in pop history as the inspiration behind SPANDAU BALLET’s ‘True’, courtesy of her brief unrequited relationship with the band’s songwriter Gary Kemp. In 2017, ALTERED IMAGES consists only of Clare Grogan from the original line-up and with a tight professional backing band, the pixie of pop was all set to see out the end of her first tour for over 30 years with a bang… this almost literally happened when she stumbled while walking off the drum rising in her heels during the marvellous opening number ‘I Could Be Happy’. Modern technology allowed for the bubbling sequences of ‘Don’t Talk To Me About Love’ to be reproduced faithfully as Grogan set out, in her own words, to play “the embarrassing mum”, swearing with aplomb in a manner that would make Alison Moyet proud! A touching dedication was made to the late Martin Rushent on ‘See Those Eyes’ which Grogan said was his favourite production, while there were surprises too with the Siouxsie-lite but now very poignant ‘Dead Pop Stars’. But the highlight was ‘Change Of Heart’, the great lost ALTERED IMAGES single with its great candy floss organ riff, while naturally to finish what was a very fun performance, Grogan got the audience up on their feet for ‘Happy Birthday’. 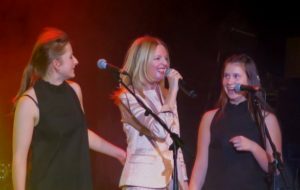 Her daughter Elle joined backing singer Poppy Lironi on stage to keep a watchful eye on her mother who was enthusiastically jumping around the stage like she had never been away. 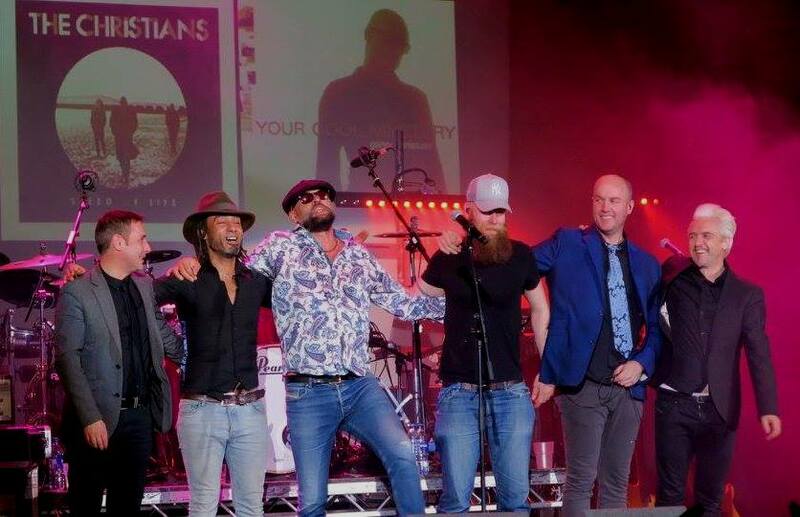 Using the essentially the same backing band, THE CHRISTIANS offered 40 minutes of thoughtful Merseyside soul with a couple of their noted covers thrown in. 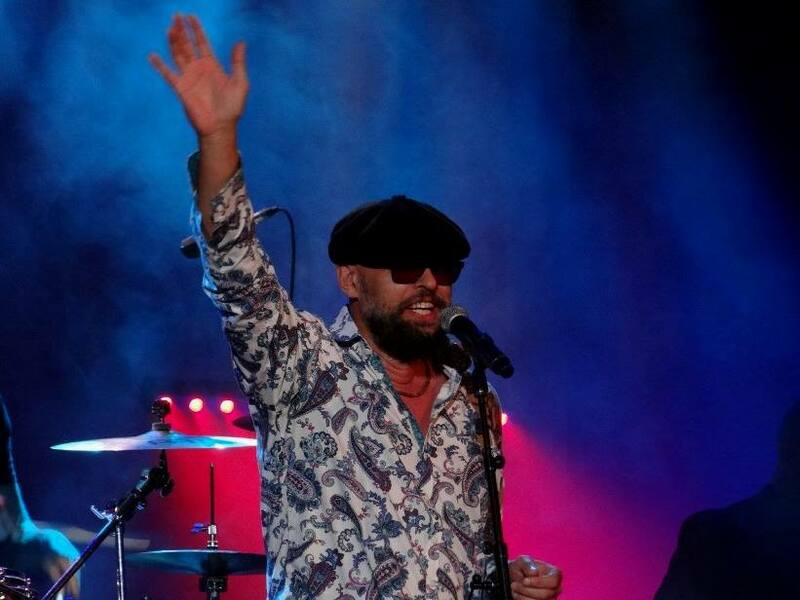 Originally comprising of the Christian brothers Garry, Russell and the sadly departed Roger with musician Henry Christian Priestman, only Garry Christian remains in today’s line-up of THE CHRISTIANS, but he was ably supported by guitarists Joey Ankrah and Neil Griffiths on the distinctive harmonies that characterised their earnest politically-tinged songs. Beginning with ‘Forgotten Town’, a song that 30 years on still sadly reflects the social climate of the UK, Christian exuded some dry Scouse humour on the leafy St Albans audience. He dedicated ‘Greenbank Drive’ to the city after seeing a road sign with the same name during the day, although he pointed out it was about the Liverpool one; the crowd didn’t seem to mind as they joined in an extended singalong. Meanwhile ‘Ideal World’ looked back at a time when Apartheid and The Berlin Wall were still in place, showing that the world has actually made SOME progress since 1987 and there is cause for optimism, before a cover of Gil Scott-Heron’s ‘The Bottle’ added a classic soulful groove to proceedings while passing social commentary on the issue of alcoholism. ‘Hooverville’ and ‘Born Again’ were reminders of the gritty pop that secured a UK No2 for THE CHRISTIANS’ debut eponymous album. But to conclude the set, there came a spirited cover of The Isley Brothers’ ‘Harvest For The World’ which was the band’s biggest UK hit single back in 1988 in aid of a number of charities including British Red Cross, Christian Aid and Save The Children. After his acoustic solo jaunts of the last few years, it was a joy to witness MIDGE URE present his ‘Band Electronica’ to journey through the key milestones of his glorious musical career. Aided by Cole Stacey on bass + synths, Joseph O’Keefe on synths, piano + violin and Russell Field on electronic drums, Ure sprung a surprise at the start with an instrumental rendition of ‘Yellow Pearl’, the track to composed with Phil Lynott which was the theme tune to Top Of The Pops’ between 1981-1985. Seguing straight into ‘Passing Strangers’, it signalled Ure’s intention to fill the gap that has opened up since ULTRAVOX last played live opening for SIMPLE MINDS in late 2013. Indeed, other than his No1 single ‘If I Was’ and a cover of Tom Rush’s ‘No Regrets’, it was stomping ULTRAVOX numbers like ‘I Remember (Death In The Afternoon)’ and ‘Sleepwalk’ that dominated the set; “I know what you want…” he quipped. However, an unexpected full-blown synthesized rendition of ‘Fade To Grey’, which Ure co-wrote and recorded as part of VISAGE, got the cautious crowd up standing with the first really big roar of the evening. 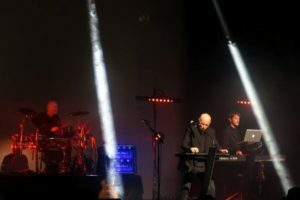 ULTRAVOX fans can be a rather understated lot, as proven by entire front rows remaining firmly seated during their comeback concerts between 2009 to 2012, but Ure’s gentle persuasion and jokes about “the dance police” finally broke the dry ice. 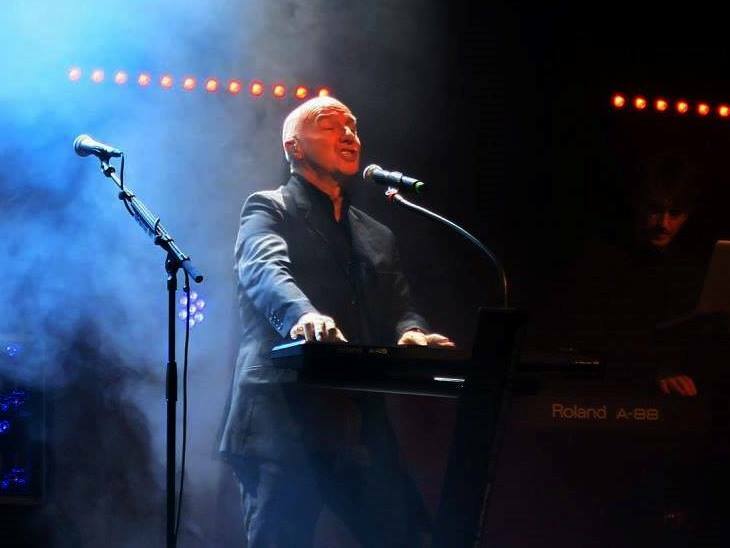 As well as the hits like ‘All Stood Still’, ‘The Voice’ and the inevitable ‘Vienna’ which had an unusual middle set placing, Ure also dusted off the blistering ‘A Friend I Call Desire’ from the ‘Lament’ album, much to the delight of the ULTRAVOX diehards. But while Ure’s voice and guitar, Stacey’s backing vocals and O’Keefe’s keys came over loud and clear, Field’s rhythmic backbone lacked power and was far too low in the mix… yes, you read that right, The Electricity Club is complaining that the live drums weren’t loud enough!!! Despite this, the band played masterfully; a heartrending ‘Dancing With Tears In My Eyes’ was a sad reminder that the Doomsday Clock has reared its head again as it moves closer to midnight, thanks to the powers that be squaring up in their playground of the 38th Parallel. A spirited version of ‘Hymn’ stole the show with O’Keefe’s recreation of its ARP Odyssey solo particularly enjoyable. O’Keefe’s synthtastic approximation of the OSCar on ‘Love’s Great Adventure’ controlled by his Roland A-88 was another worthy moment to end a fabulously entertaining evening. Ure’s ‘Band Electronica’ format was a worthy substitute for the absence of ULTRAVOX, although it did recall the solo Andy McCluskey version of OMD that toured between 1991 to 1993 when key band members were noticeable by their absence. But that could be said about the other two acts on tonight’s bill and their performances were not made any less valid by their absent friends. At the end of the day, it is the songs that count and as Ure gleefully sang on ‘Love’s Great Adventure’, “I stood the test of time”.